Remember, your cat's diet deserves the same TLC as your own. When making these treats, wash your hands frequently, avoid cross-contamination of ingredients and equipment and store leftovers properly. What better way to show the love than with some sealed-with-a-heart tuna fish treats? It doesn’t need to be Valentine's Day to whip up a batch of these snacks that will last up to 10 days in the fridge. These treats with a satisfying crunch incorporate healthy coconut flour, but you can substitute ground-up old-fashioned oats. Either canned tuna or canned salmon will work fine. Next time you're preparing chicken for dinner, include a little extra to make these crispy nuggets of goodness. If you (or Fluffy) prefer, swap out the chicken for tuna or salmon. Really, who doesn't love cheese? These cheddar and Parmesan nuggets are firm on the outside with a soft, chewy interior. These bite-size treats are named after the cat of a food blogger who created the recipe. Add your cat's favorite ingredients, or prepare as-is for a healthy "vegetarian" treat. Smooth and creamy peanut butter makes these soft, chewy treats a nice alternative to crunchy snacks. The cookies can be frozen and transferred to the refrigerator as needed. 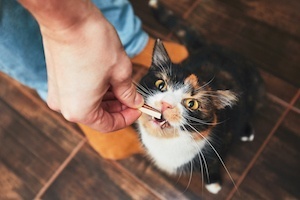 Be sure and do a little taste test first to make sure your pet likes peanut butter. Preparing this simple mixture of ground beef, eggs and catnip takes only 15 minutes from start to finish. Use them as treats or crumble them for a "garnish" atop Fluffy's regular food. All pets should celebrate their special day. Cats don't have the ability to taste sweets, so a conventional cake won't do. But trust us, this fish-flavored treat will seem like the finest chocolate cake to your pet! P.S. This recipe doesn't have to be saved only for birthdays. With summer just around the corner, your cat will stay nice and cool with these "kitty popsicles." They'll keep in the freezer for up to six months, so make a big batch to get Fluffy through the season. Here's another refreshing warm-weather treat that includes only one ingredient. Goat milk is easily digestible, but if your cat's stomach is on the sensitive side, use a milk that's formulated specifically for felines. Do NOT use cow milk, which frequently causes gastrointestinal discomfort in cats. Pamper your pet even when you're away by placing a few treats in one of these entertaining and educational treat dispensers. What interesting treats do you offer your cat? Share in the comments!